Today, something long-awaited in our house: A card holder for Settlers of Catan! The design is an extension of Zarquon's Game Card Holder, which is itself a derivation of condac's Game Card Holder on Thingiverse. In this version Tinkercad was used to add tabs on the tops and bottoms as well so that you can make a grid for your cards when playing the Cities and Knights expansion game; if you order the cards as in the picture it can help you keep track of which commodities and progress cards go with which resources. We also made the corner walls higher since our cards tend to be bent up a bit and need more storage space as a result. Settings: Afinia with .2mm resolution on "normal", in 27-29 minutes for each of the twelve pieces. Technical notes: The 12 pieces fit together just perfectly with the settings above on this particular printer. 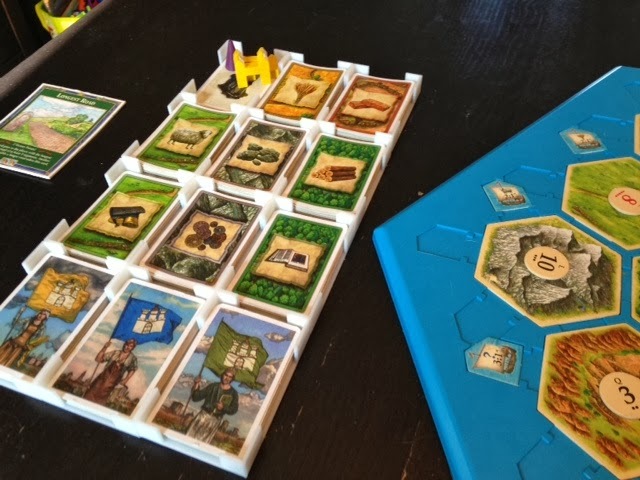 The blue board in the picture is the excellent Official Plastic Catan Board from mycatanboards.com.